CARACAS, Venezuela -- Red Cross volunteers distributed the first shipment of badly needed emergency supplies in Venezuela on Tuesday after months of feuding between the government, which has denied the existence of a humanitarian crisis, and opponents who have been seeking to use the delivery of aid to force President Nicolas Maduro from power. 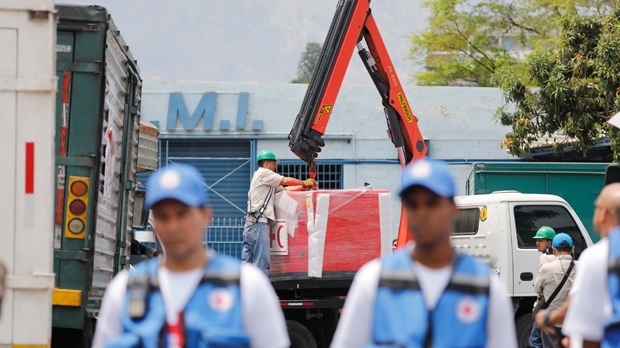 On Tuesday evening, Maduro sought to claim credit for the arrival of the first batch of Red Cross aid, saying on national television that his government co-ordinated it in line with "international protocols." In late March, the International Federation of Red Cross and Red Crescent Societies announced it would soon begin delivering assistance to an estimated 650,000 people and vowed that it would not accept interference from either side of the polarized country. Federation President Francesco Rocca said Red Cross workers would focus on the medical needs of hospitals, regardless of whether they are state-run or not -- a pledge repeated Tuesday. Guaido, meanwhile, lashed out at Maduro's government for letting Venezuela's health crisis spiral out of control.